It's become nearly impossible to listen to just about any band and NOT here a little Devo in there somewhere. They are the masters of a daring combination of theatrics, science fiction, satire, wit, and songs that are remarkably catchy. Like any good movement, they have remained a constant reaction against an array of trends from the hippies who grew up and sold out to the punks whose message against the system got lost among their self destructive ways. In 1976 a short film the band participated in garnished attention from Neil Young (how is that for strange bed fellows?) who asked them to work along side him in a crazy film he was putting together called Human Highway. In the years to follow the band released their first few singles and both David Bowie and Iggy Pop were such fans of this truly original group, that they pushed for the band to Warner Brothers. 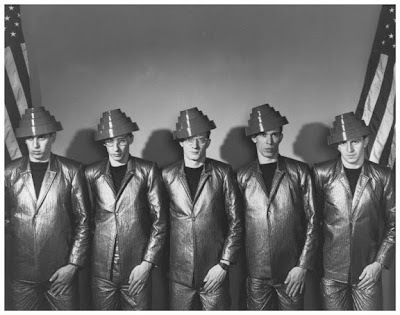 Devo's popularity only escalated and spiraled out from there and soon even grandmother's were aware of the band who wore colorful "energy domes" on their head that looked a bit like an art deco flower pot made from plastic. Never fitting the mold of any one kind of band stylistically, Devo has married rock to electronic music which in turn has led to an array of sounds luring in generations of fans who love punk, pop, art, theater, rock, dance, new wave, industrial, Sci-fi, and disco / electronic music. In short, there is truly a little something in their songs for everyone which not only has helped to sustain their popularity but continue to spread their original message of DEVOlution to the masses. It's now 2010 and the group is still releasing music, with a brand new long player called "Something for Everybody". This has inspired us to spend two hours with the band's legendary catalog as well as an endless list of bands they have inspired both visually and musically since the late '70s. Tune in tonight on www.wrir.org or 97.3 on your dial locally from 7pm to 9pm tonight; jumpsuits are not included.